Decorating has taken over my life this month...and I love it! The main color scheme in my living area used to be black and brown until I added some blue pillows to go with the blue accent wall. Now I decided to brighten up the space with a secondary color: orange. Just so you know, orange, blue and brown totally go together. 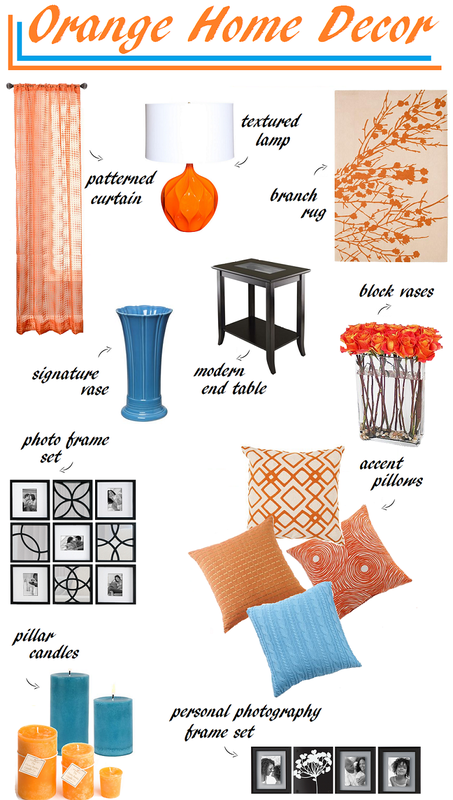 So these are some pieces that I'm thinking about adding to my decor with orange as my main inspiration. What do you think about this color combination? Have you decorated lately? P.s. Can you believe what this website said about the name "Cheryl"--it's pretty accurate! The name of Cheryl brings opportunities for success in business and financial accumulation. So cool you have a website named after you:) And I love love love orange. That curtain...I want that too! I can't agree more with you! Orange is such a great colour and works for quite everything! It's such an uplifting color Cheryl. I love it in fashion and makeup. You're going to love it in your home. Love the colors you're going to pair it with. That is so cool about your name. I need to look mine up. I love orange color for home decor! Such a vibrant, energetic color to bring any look together! I just came back from vacation and now catching up with all ur previous posts! Hope you are having a wonderful day! I absolutely love orange and teal together. These colors are actually the color scheme of my dining area! (It was supposed to also be the same for my kitchen, but my boyfriend kept purchasing red appliances!). It's always so much fun to read insights to our names! I love the bright textured lamp! I can definitely see you feeling free when you break from a sense of monotony. I love that confidence and success are expected as well. Great round up Cheryl, loving that vase. I love adding bright colors and prints in my decor - that throw pillow is so fun! So beautiful. All these colours are so tempting. I love the block vases. I want to redo a few spaces in my home but I don't know if I'm ready for a project like that. I spent half of my summer in home project, I worked mainly on the living room this time with my husband, repainted the furniture ourselves! Sometime I will show the finished project. I love your choice of citrus feel...although myself I love roses and white.It's always exciting to decorate! Orange is certainly your color of the moment. Thanks for linking up something orange last week and again this week on the style hop!